Even before they were in the Big Ten, Maryland never really had a football rival. Will this weekend's last ditch chance at bowl eligibility in Happy Valley do anything to change that? WASHINGTON — Thanksgiving Weekend gives college football the crescendo of archrivals clashing across the country. In-state matchups like Alabama-Auburn and Clemson-South Carolina have playoff ramifications, while Michigan and Ohio State play for more than just a Big Ten East title and the usual bragging rights. USC has spoiled Notre Dame’s National Championship hopes in the past; this year the Trojans are fighting not just the Irish, but for bowl eligibility (and relevance). The second-tier affairs range from something tangible (Washington-Washington State is for the Pac-12 North) to something else (Ole Miss-Mississippi State I believe decides if eggs in the Magnolia State will be poached or scrambled over the next calendar year) to nothing at all (let’s not kid ourselves, Indiana and Purdue are fully focused on hoops). But regardless of the stakes, college football’s rivalries deliver dislike and begrudging respect. Which brings us to Maryland’s situation … as a dancer without a true partner. For years, the Terps thought of themselves as Virginia’s ACC rival, and the Cavaliers thumbed their nose north by saying their true football foe was North Carolina (dubbed “the South’s Oldest Rivalry”) even though the Tar Heels laughed every time that was uttered. Virginia Tech supplanted the Terrapins as the ACC’s northernmost rivalry before they left the league. Which brings us to the Big Ten. There are two schools in decent proximity of College Park. 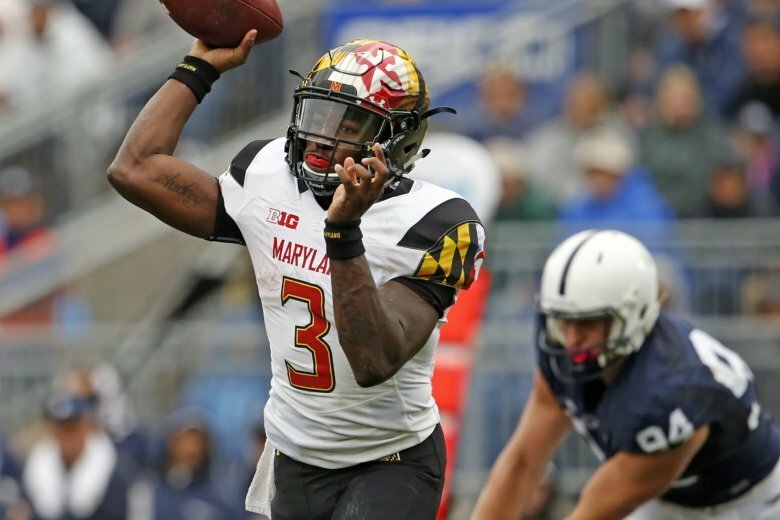 Penn State will have nothing to do with a rivalry with anyone — let alone Maryland. And given how Rutgers has been either a dumpster or tire fire since joining the Big Ten, do you really want to use the Scarlet Knights as a measuring stick or focal point for your program? One of the cases for lagging attendance at Maryland has been the fact that the must-win games like West Virginia, Virginia, or even Clemson have disappeared off the slate. Until they find a worthy partner, the Terps will be dancing with themselves when it matters most. You may have heard that the Cavaliers haven’t beaten the Hokies since Tech joined the ACC in 2004. During the 14-game losing streak, four of the games have been one-possession affairs. Two of those losses prevented U.Va. from reaching a bowl, so as they face the weakest Virginia Tech team in more than 25 years, there’s a chance for sweet revenge. These Hokies rank 11th in the ACC in scoring and in points allowed. If a bowl-bound Virginia led by dual-threat quarterback Bryce Perkins doesn’t beat Virginia Tech this year, when will they? The Midshipmen’s tour of single-colored foes continues, but they’ll find the Green Wave a little tougher than the Tulsa Golden Hurricane. Tulane has won three of four behind backup quarterback Justin McMillan. Navy QB Zach Abey is coming off his best day (128 yards and two rushing touchdowns) since suffering a shoulder injury last season, but the Green Wave are one of the better teams at stopping the run in the conference. Their 33 sacks are also tied for the AAC lead, but that won’t help much against the Navy option. At the other end of the pass rush spectrum are the Mids, who are tied for last with just eight sacks on the season. That will hurt. One week after losing to Ohio State by one and two weeks after losing by two at Indiana, the Terps have a final shot at bowl eligibility. The Nittany Lions are coming off an underwhelming win over Rutgers, and three of their other seven wins have been one-possession affairs. Senior quarterback Trace McSorley is having his best year as a runner and his worst season as a passer. The Nittany Lions don’t have Saquon Barkley in their backfield this year, but junior Miles Sanders is averaging 5.7 yards per carry. Expect freshman Anthony McFarland to continue his November to remember (525 yards rushing over three games this month) against the 10th-rated defense against the run in the Big Ten, but the lack of a consistent passing game will once again torment the Terps on a chilly afternoon. The Tigers make the tournament for the first time since they reached the 2013 championship game. The team’s turnaround this fall can be traced to transfer Tom Flacco (younger brother of Ravens QB Joe) who has helped the school lead the CAA in passing yards, total offense and scoring. Problem is, Rob Ambrose’s defense is at near the bottom of every defensive category in the conference — except against the run where they lead the league. Good thing these Dukes bear little resemblance to their James Madison namesakes: five of their eight wins were one-possession affairs. It’s an early exit for the automatic-qualifying Northeast Conference champs. A rare first-round game between fellow conference members was made possible because the Dukes and Blue Hens did not play during the regular season; if we go by the old NFL tiebreaker of “common opponents” JMU has the 5-2 to 4-3 edge. They also have the edge on third down —coach Mike Houston’s team ranks first in the CAA at moving the chains while his defense is fourth best at getting off the field on the money down. Delaware … not so much. Although we’ve seen Danny Rocco-coached teams come out of Harrisonburg with upsets in the past, the Blue Hens enter this postseason with two straight losses. The Dukes will likely make it three.